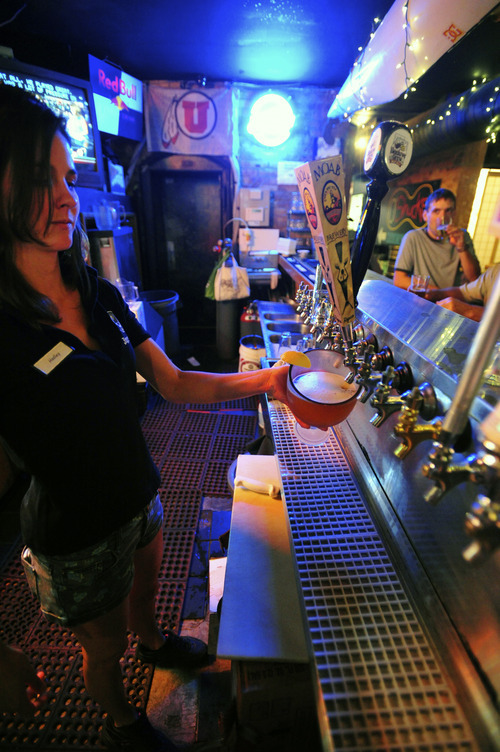 Bar exam • Monthly pub crawl offers education with libation. Stephen Speckman | For The Salt Lake Tribune Pub crawlers Phelix Gardner (left) and Michael D.S. Mack meet in front of O'Shucks Bar & Grill during the Utah Heritage Foundation's Thirst Fursdays Historic Pub Crawl, held Sept. 6 and on the first Thursday of each month. Stephen Speckman | For The Salt Lake Tribune O'Shucks Bar & Grill bartender Hadley Hege serves up a schooner of Moab Over The Top Hefeweizen beer as pub crawler Sean Lang tips a cold one during the Utah Heritage Foundation's Thirst Fursdays Historic Pub Crawl, held Sept. 6 and on the first Thursday of each month. Stephen Speckman | For The Salt Lake Tribune Pub crawlers make their way to Murphy's Bar & Grill during the Utah Heritage Foundation's Thirst Fursdays Historic Pub Crawl, held Sept. 6 and on the first Thursday of each month. 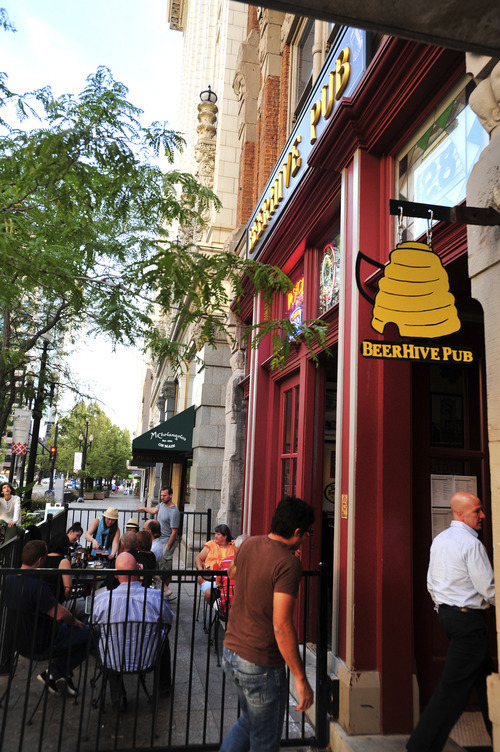 Stephen Speckman | For The Salt Lake Tribune Patrons enter the Beerhive Pub during the Utah Heritage Foundation's Thirst Fursdays Historic Pub Crawl, held Sept. 6 and on the first Thursday of each month. Stephen Speckman | For The Salt Lake Tribune Beerhive Pub boats over 200 beers and was the last stop during the Utah Heritage Foundation's Thirst Fursdays Historic Pub Crawl, held Sept. 6 and on the first Thursday of each month. 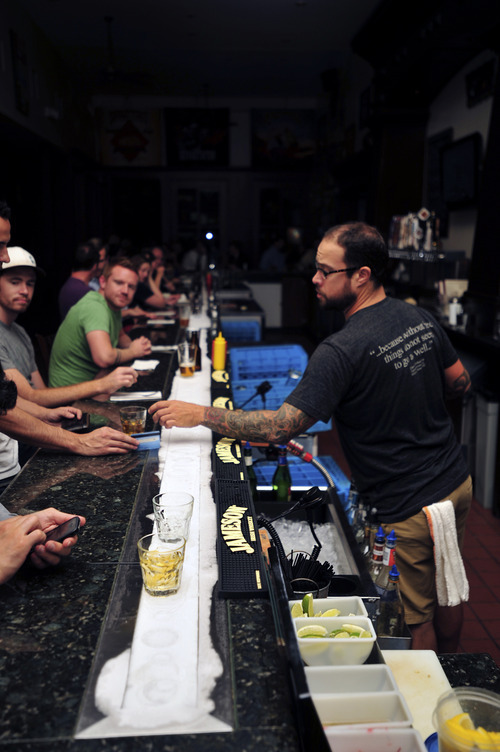 Stephen Speckman | For The Salt Lake Tribune Beerhive Pub's ice bar keeps drinks cool at the last stop on the Utah Heritage Foundation's Thirst Fursdays Historic Pub Crawl, held Sept. 6 and on the first Thursday of each month. 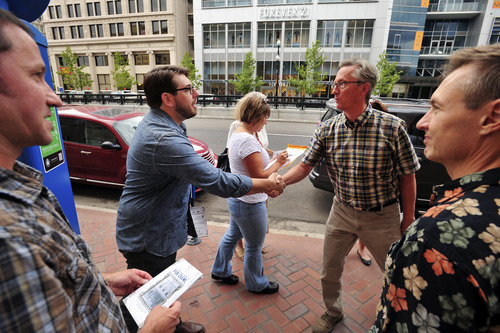 Stephen Speckman | For The Salt Lake Tribune Pub crawlers gather outside of Murphy's Bar & Grill during the Utah Heritage Foundation's Thirst Fursdays Historic Pub Crawl, held Sept. 6 and on the first Thursday of each month. 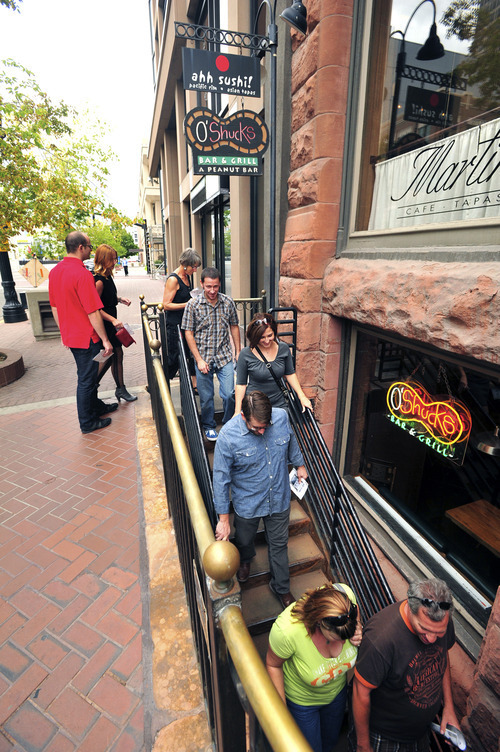 Stephen Speckman | For The Salt Lake Tribune Pub crawlers descend into O'Shucks Bar & Grill during the Utah Heritage Foundation's Thirst Fursdays Historic Pub Crawl, held Sept. 6 and on the first Thursday of each month. A Mormon is credited with starting the first documented brewery in Utah way back in 1856. The Hot Springs Hotel and Brewery sat on land now occupied by the Utah State Prison. That's just one of the bits of beer history that Cevan LeSieur served up recently for the Utah Heritage Foundation's Thirst Fursdays Historic Pub Crawl in downtown Salt Lake City. The brewery pioneer was none other than the notorious Orrin Porter Rockwell, bodyguard to Joseph Smith and Brigham Young, who apparently saw an economic opportunity for The Church of Jesus Christ of Latter-day Saints to unofficially control liquor production in Utah. Back in 1874, there was even a brewery being housed inside the LDS Church's Salt Lake Tenth Ward building, according to the literature handed out before the bar hopping began. This month's Thirst Fursday pub crawl began at O'Shucks Bar & Grill, then moved to Murphy's Bar & Grill and ended at Beerhive Pub. All three stops are within a half-block or so of each other. The Utah Heritage Foundation originally planned only three crawls over the summer, but the events drew enough interest to continue the events through the end of the year. "I'm really interested in the history of downtown," said crawler Suzy Millward, who was attracted to the Sept. 6 event by the promise of local history and, of course, beer. Millward and her boyfriend, David Thimm, were joined by about 20 people, including Scott Beck, president of the Salt Lake Convention and Visitors Bureau, and several of his employees. Beck said he's interested in promoting the crawls on a national level. Inside O'Shucks, Millward and Thimm clinked pints at a table set against the warm hues of exposed stone and brick that defines the interior of the 37-foot-wide building, designed in 1890. At the far end of bar, there's a metal door leading to an old bank vault, now a cooler, left over from when the building was the Utah Commercial & Savings Bank until 1919. O'Shucks opened in 2000, and now the subterranean setting also houses Ahh Sushi. The restaurant offers lunch and dinner deals throughout the week so your visit won't "break the bank," says manager Kristi Schwerin. After about a half-hour, LeSieur and Carolynn Bottino, manager of the Heritage Foundation's Memorial House, herded the group to Murphy's, in a building built in 1892 to house another bank. The bar has been serving drinks for 34 years  its slogan is "A step down in social clubs"  but previously the bank building was used for mining company offices, a jewelry store and an ice-cream shop. 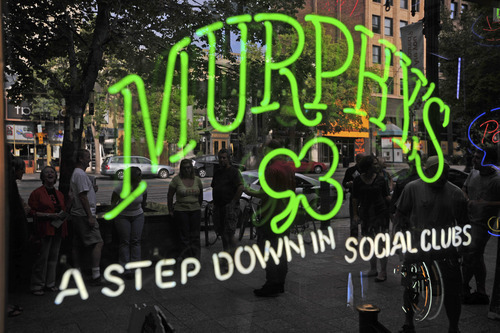 Bartender Tony Moe describes Murphy's as "the way bars used to be," where 90 percent of the customers are regulars whom employees know by name and by drink. The pub crawl ended just up the sidewalk along Main Street between 100 and 200 South in an area that around 1902 was known more for gambling and prostitution. Now commonly known as the Daynes Building, it hosts the popular Beerhive Pub, offering over 200 brews while emphasizing locally crafted beers. "If there's a beer made in Utah, we try to get it here," said owner Del Vance, author of the 2008 book Beer in the Beehive: A History of Brewing in Utah. Vance likes to say Beerhive exists so people don't have to try home brewing. "Trying [to home brew] is the first step toward sucking," he said with a laugh. Vance established the pub downtown because he wanted to be in a historic building. "I'm a big history buff," he said. 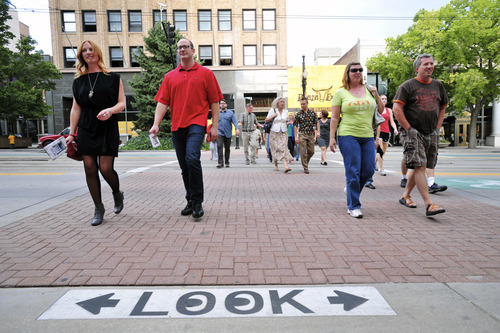 That, and he wanted to be close to all the traffic from downtown's City Creek Center. "The poor guy whose wife is over there spending the family fortune is going to want to drink," he joked. The Beerhive features a frosted rail running the length of the main bar where you can keep your drink cool if the conversation runs a bit long. Michelangelo's restaurant next door provides food if you get hungry. And don't forget to check out Vance's enlarged prints of old photographs that show what downtown Salt Lake City looked like 100 years ago. 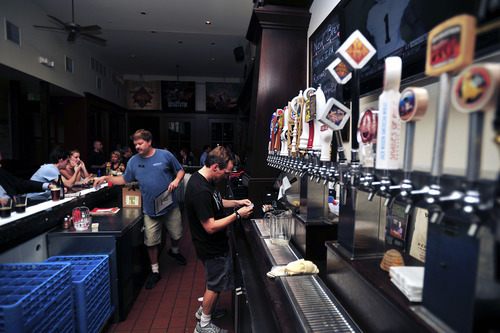 Learn about Utah's beer history while tipping a few cold ones during the Utah Heritage Foundation's Thirst Fursdays Historic Pub Crawl, held on the first Thursday of each month. Where • Pub crawl stops are revealed after you register. Tickets • $20; $15 for Utah Heritage Foundation members, at http://www.utahheritagefoundation.org/tours-and-events/pubcrawl or 801-533-0858.